1 para / 3 dengas 1772 - MON. MOLD: I VALAK. ~29 mm diameter, ~11 g, copper? 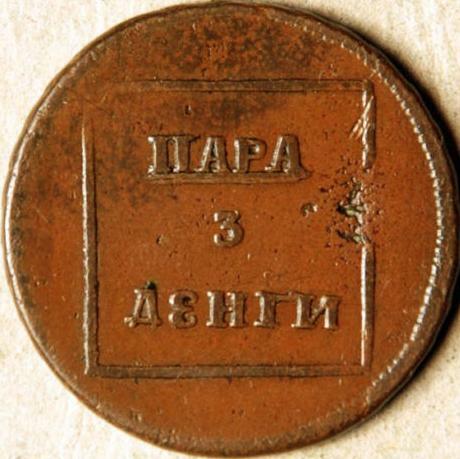 The images of this coin are present on the site by courtesy of eBay user flying_bostonian, owner of store "RUSSIAN MINOR AND WORLD COIN”, http://stores.ebay.com/russianminorandworldcoinstore/. Almost all 1 para / 3 denghi coins bear year 1772 and legend MON. MOLD: I VALOSK. 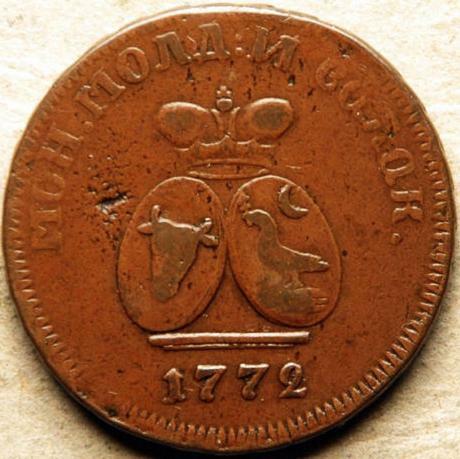 A small amount of coins were struck in 1772 with legend MON. MOLD: I VALAK. - legend that had been used on 1 para / 3 denghi of year 1771. It is assumable that at the beginning of year 1772 a decision was taken to have the legend modified, and the part bearing the 1771 legend, struck in 1772, would be the first 1 para / 3 denghi coins struck in 1772.